However, with students completing their assessments completely on their Chromebooks (including receiving their score, feedback, and some immediate remediation), parents and families don't get to see their child's results like if they had a paper/pencil assessment and thus can't work with their students to help them improve. I do check and send home their written work for math assessments, but many history and language arts assessments are completely digital. If we truly want parents working with their students at home, we need to be sure that they can see where the students have made mistakes, along with the questions and correct answers. 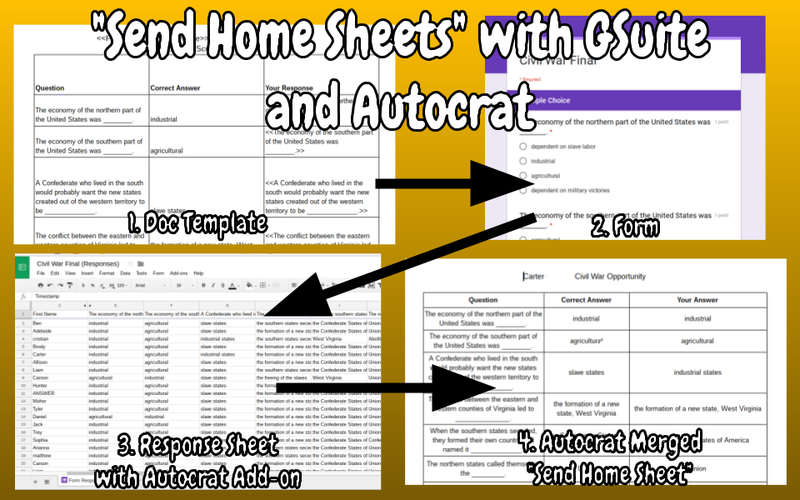 One of my favorite Google Sheets Add-ons is Autocrat. It's a powerful tool that essentially allows you to create a mail merged Doc from a Form/Sheet. For a brief bit of background knowledge on Autocrat, it operates with tags that appear like this: <<response>>. (I sometimes call the tag arrows "carrots.") You create a Doc template with <<tags>> in place of things you want inserted from the Form/Sheet. For example, if I wanted to ask a question about what a student thought the capital of Virginia was, I would put <<Virginia capital>> or something similar on the template Doc, and when I run Autocrat, it would fill it in with their response (which would hopefully be Richmond!) This can be set up to run automatically, and once you get the hang of it, it's incredibly easy to use. I'll admit that Autocrat isn't the easiest thing to explain in a blog post, but the video tutorial will make more sense. 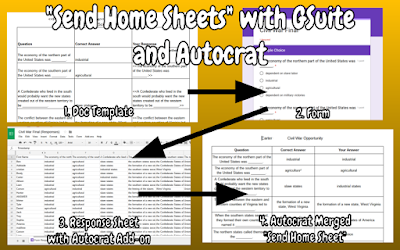 Using Autocrat, you can make a Google Doc that inputs each student's responses from a Google Form assessment, along with the question and correct response, which I call a "Send Home Sheet." You can then print them or have them automatically emailed to parents for them to review and help begin remediating. Watch this video to see exactly how to do it. When all is said and done, it takes roughly 5 minutes to set that all up. Copying and pasting from the response sheet saves lots of time in the "mapping tags" step, and keeps the formatting in nice and even columns. Part of the benefit of doing assessments on Google Forms is the elimination of paper. This method seems to directly conflict with that, but in the long run, it's still less paper. My students recently completed an assessment that was 23 questions. If each question (and all four to five answer choices) were printed, it would have been 7 pages. Furthermore, by using the Quiz feature on Google Forms or Flubaroo, I didn't have to do any of the grading by hand. I'm a big fan of letting technology do as much of my rote tasks as possible so I can focus on using the assessment results to work on remediation. Finally, and possibly most importantly, some parents aren't ready to accept that they might not see their student's work. This is a valid feeling, because if they want to help (and we need them to play a vital role in their child's education), they need to see where the gaps are. "Send Home Sheets" allow the best of all worlds - less paper waste, more time for the teacher to work on more important tasks, and gives the parents something tangible to review. Give it a whirl in your class and let me know in the comments below how it works out for you! I never knew the proper way to send sheets. I always had problems while sending them. But I'm glad to know that these things exist. I'm sure this will make things much easier.